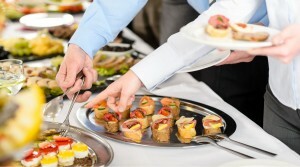 When you need caterers with experience, creativity, and culinary excellence hire JC’s caterers in El Paso, TX. We are quickly becoming a local top choice for food services in El Paso, Texas. We offer unique food packages that are based on your personal catering needs and preferences. Our delicious food satisfies your hunger and leaves your taste buds wanting more and more. It doesn’t matter how big or small or what kind of event you are having, rest assured that we can make it extra special and memorable. Our staff is very professional, friendly and knowledgeable. We will always prepare food in the perfect way so that you can accommodate large or small parties with generous portions of your favorite home style prepared dishes. For over 15 years, I’ve been perfecting my family’s secret home style recipes. A lot of businesses in El Paso depend on us to cater everything from a impromptu last minute “just because” catering orders to well planned large company parties. We bring them right to your table at our restaurant or at your event. Everyday, all our custom dishes are made from scratch – packed with the freshest ingredients and attention to detail. Don’t forget to try our famous Antojitos! I am committed to providing you with the best tasting food delivery, professional catering services, and El Paso’s best taste!